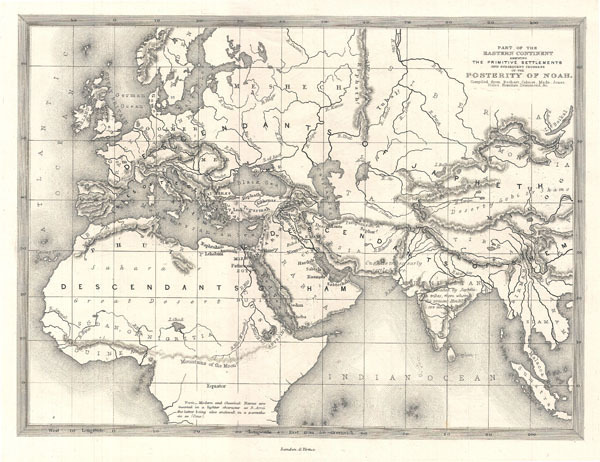 This is a beautiful c. 1850 map of Europe, northern Africa, and western Asia. Drawn to illustrated the 'Primitive Settlements and Subsequent Progress of the Posterity of Noah compiled from Bochart, Calmet, Mede, Jones, Hales, Hemings, and Drummond.' Labels the lands where Ham, Japeth, and Shem (the sons of Noah) settled following the Deluge. Makes note of mountain ranges, rivers, and bodies of water. Note on bottom addresses the labeling of land using classical and modern names.